After work today I had been invited to the Sky Bet offices to help them with a little bit of Market Research. They wanted a customer’s opinion on some items related to multiple betting and I was happy to help. I was there about an hour and we had a good chat about everything…so now I have a £50 fee sat in my account just burning a hole and staring at me. Accumulator of all the teams who have won the most games in each match. If they are tied I go with the team which has lost the least games. Accumulator of all the teams whose starting pitcher has the best ERA of the two. Accumulator of all the teams that are playing at home. Because of the nature of Baseball, there can be anything from 6 games to 15 games a night. But, going on my own thoughts and those of my mate Steve, we said that the Boston game was one hell of a hard one to call…so it needed to be avoided. Incidentally the above pays £325 if it went in. 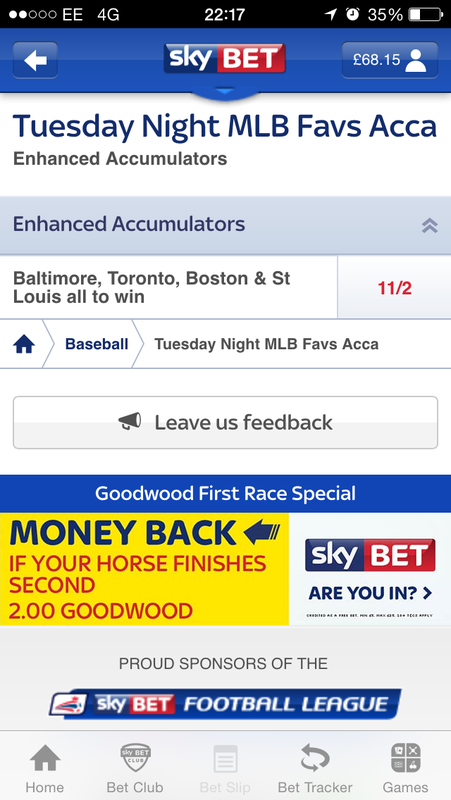 Can I turn £50 of free money into £226.15 of free money? Let’s wait and see. 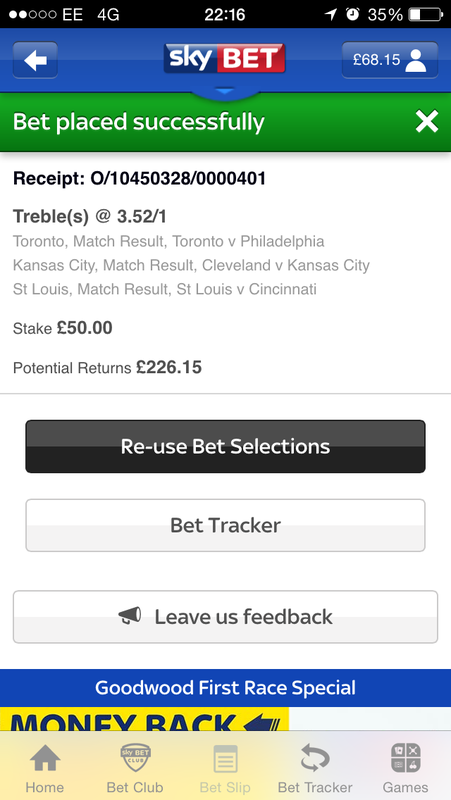 This entry was posted in Baseball, Betting, Uncategorized and tagged Baseball, betting, free money, gambling, Kansas City Royals, LA Dodgers, MLB, Sky Bet, St Louis Cardinals, Toronto Blue Jays. Bookmark the permalink.